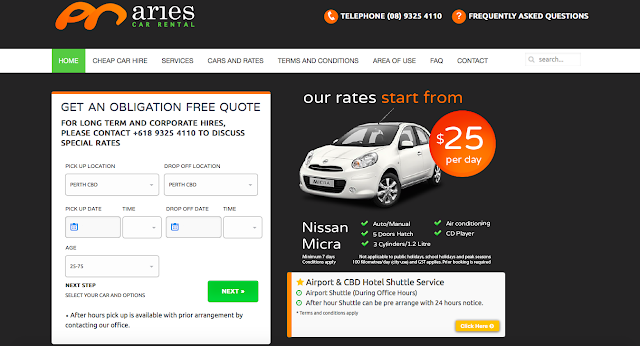 ARIES CAR RENTAL PERTH WA : HOW TO RENT A CAR IN PERTH - . It is more convenient for you to rent a car than using the public transport if you are travelling to WA. For my trip, my sis decided to go with ARIES CAR RENTAL, because it was the cheapest of all compared to other car rental. plus, ARIES seems to be very famous among us Malaysian. I did whatsapp Mr Jo and compared his price with the website price, and the price on their website is lower. Not sure why, did not ask as i prefer booking through website. Disclaimer; This is the process of my booking. 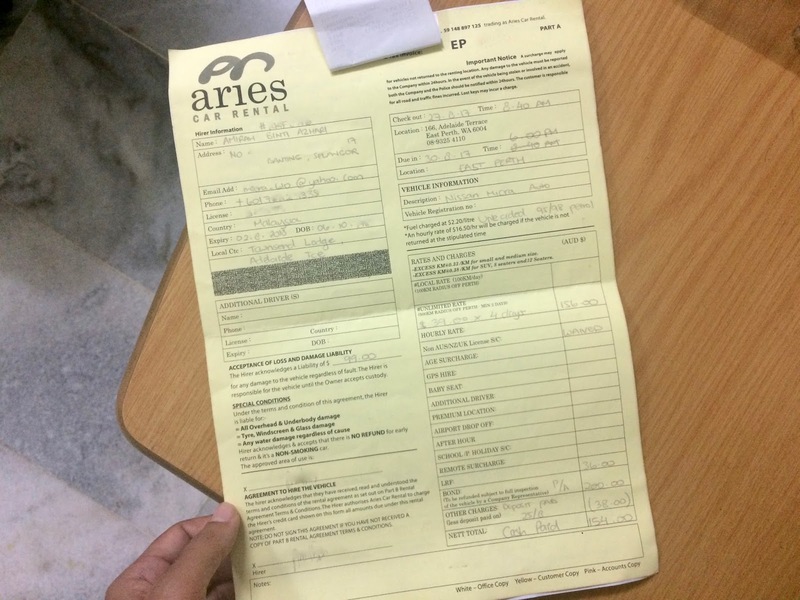 It may be different with other people, dealing with other Aries Car Rental worker. 1 -Simply fill in the form,where you want to pickup the car and the date. 2- choose which car you want. For me, we choose the cheapest car they offered. The date in the picture below is a dummy date just for the sake of this post. 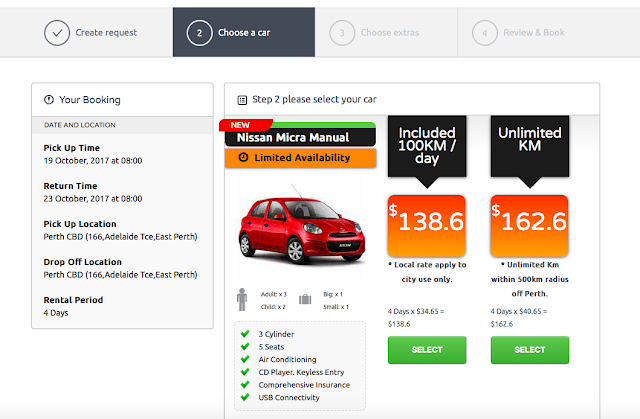 We picked UNLIMITED KM because we will be driving to the Pinnacles and Margaret River. Note that, Aries Car Rental will ask where you will be travelling and if you are going very far from Perth, contoh nya Albany they might not give you the Nissan Micra as the car is small and not suitable for long journey. They will suggest other car to you. 3- Just tick which ever you need any of these. * Additional Drivers means, that there will be another driver selain daripada you. Another case is, you book the car = you are the driver, but you make payment using other people's credit card. The owner of the credit card also need to be declare as additional driver, WALAUPON dia tidak memandu. To save money, just book and use your own credit / debit card to make payment to avoid additional payment of aud20. Boleh sahaja untuk berlaku tidak jujur dan pakai card orang lain untuk bayar, but.. i am a very jujur kind of person like that, haha. We tick this because in case if any accident. Who knows,kan? We did not tick this as you can buy local sim card + internet and use google map / waze. 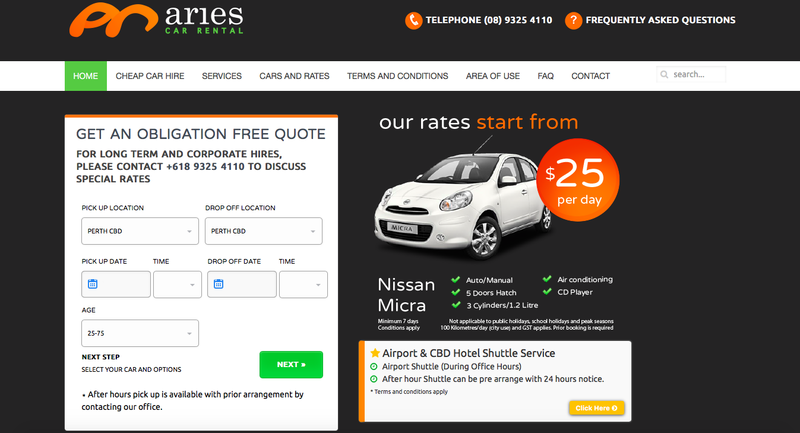 5- In 24 hours, Aries Car Rental contactd me all the way from Perth to confirm my booking. but slightly small problem on the payment. They called me at 7.00AM in the morning LOL. They werent able to charge deposit on my debit card. I had to take picture of my debit card, front and back. and whatsapp it. Bahaya to do this but i malas nak fikir. after that, berjaya. they charge 37usd for deposit. DONE BOOKING. now, process in Perth. 1- Di Perth, you will have to pay bond of 200aud. When you return back the car, they will release back the bond. 2- Pay balance. Can pay by credit / debit card or cash, no problem. I paid mine using cash. sebab duit dalam bank tidak mencukupi, hihi! 3- You will get 2 form. 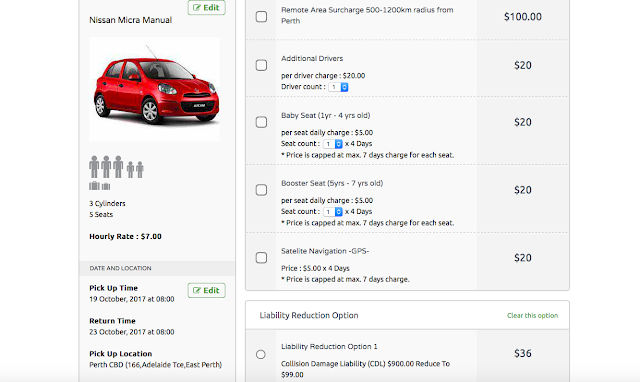 1 booking form and the other is the terms and cons form if anything happen to the car. They will explain to you and you can ask anything back. 4- They will highlight these 2 important things to you and 1 other thing i will inform below. * Processing fee of $38.50 for each infringement processed. Maksudnya, kalau you ada buat kesalahan undang-undang di sana, they will charge this to you for each saman. I did get 1 saman of parking and the car got towed, LOL. can read it HERE! 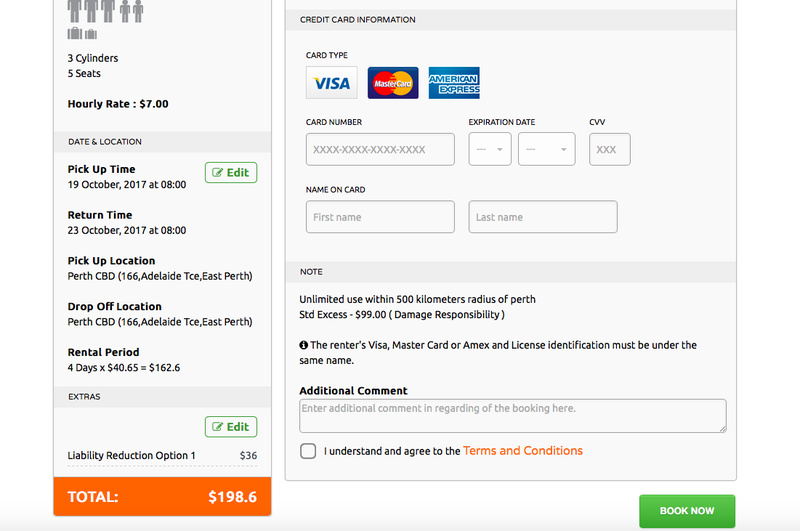 They did not ask me to pay anything or maybe it was already in the saman i paid to the City of Perth. 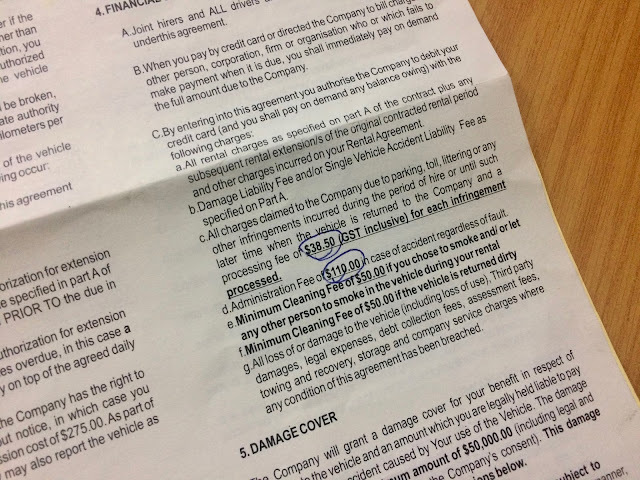 ** Administration fee of $110 in case of any accident walaupon bukan salah you. *** Car fuel must be at the same level sepertimana you pick up the car. If below the level, they will charge you higher than the actual fuel charge at the petrol station. so better isi minyak siap-siap sebelum pulangkan. My feedback on the company and the car? - The car they gave me was good as new! really love it. - The worker checked every small detail of the car (etc ..scratches ) before handing it to me. - Worker explain every detail to me and there is no hidden charges. - Returning process was also easy. - They are open even on weekends. - Worker give lots of tips on places where accidents usually happen. * On the way to the Pinnacles banyak accident where people hit wild kangaroos! so please avoid driving at night. * If you are from the Pinnacles and have to return the car that evening, you have to start driving from Pinnacles paling lewat 3pm so that you arrive in Perth sebelum their office close at 6pm. * If going to the Blue Boat house, the worker advise seorang jaga kereta, then yang lain bergambar. then bergilir. sebab Blue Boat House paling banyak case pecah kereta!